This image is from the 1927 travel guide Paris With the Lid Lifted. Hemingway called Paris in the 1920s “one long binge,” and he was pretty much right. WHAT YOU PLANNED TO DO. June 4: Steamer Saponia Arrive Cherbourg. Spend night in Paris. June 4: Saponia one day late. Spend night on tender, under pile of suitcases. June 5: Notre Dame in morning. Louvre in afternoon. Look up cousin. June 5: Spent day in Cherbourg. Got plastered at station. Paris at midnight. June 6: Arrange finances at bank. Buy presents for people at home. June 6: Slept all day. Sat at table on terrace at Cafe de la Paix and watched people go by. June 7: Morning, visit tomb of Unknown Soldier. Afternoon, Tulleries Gardens. June 7: Slept and sat at Cafe de la Paix and watched people go by. June 8: Visit Napoleon’s Tomb, Eiffel Tower, Trocadero, Cluny Museum. June 8: Changed from Cafe de la Paix to Harry’s New York Bar. Watched pink elephants go by. June 9: Visit church of the Madeline, Palais de Justice, Arc de Triomphe, Pantheon. June 9: Sat at Cafe de la Paix and watched people go by. June 10: Spend day at Versailles, going through Palace. June 10: Started to look up Cousin. Sat in Harry’s New York Bar and watched the entire Noah’s Ark go by. June 11: Spend day at Palace of Fontainebleau. Through the beautiful Forest. June 11: Got more money. Sat at Cafe de la Paix until it began to rain. Went to Harry’s New York Bar and got still wetter, inside. June 12 to June 19: Visit Malmaison. Famous Picture Galleries and Art Studios in Latin Quarter. June 12 to June 19: Went to Henry’s New York Bar. Henry’s Bar. Scribe Bar. Cintra Bar. Cafe de la Paix and watched—took nap. June 20: Sail for home. What happened to a lot of drunk Americans, apparently. Image taken from Paris With the Lid Lifted. Such blatant public drunkenness scandalized the older folks of Paris. Where most older Europeans would partake of “softer” alcoholic beverages like wine, savoring the drink on its own merits over, say, the course of a meal, the younger set were experimenting with the new way of American drinking: guzzling the hard stuff with the goal of getting drunk as fast as possible. While one could argue that this attitude was a natural outcome in Prohibition era America, where the awful 90% proof homemade crap you had on hand would hardly be something you’d want to spend time savoring, it was seen as unnecessary and gauche behavior among Europeans, particularly considering France’s ancient traditions regarding fine wine. Such erratic behavior worried the older folks, who thought their youth were losing their ability to appreciate a fine glass of wine. Paris elders found such drunken behavior particularly appalling among France’s young women, who one doctor considered “laudably immune” to alcohol’s ill effects prior to the arrival of American-style cocktails. One study claimed that not only were women enjoying more cocktails than their male counterparts, but they were doing so with much greater frequency. According to the Academy of Medicine, eighteen percent of women had greater liver damage than their male counterparts, who were as low as nine percent. Various reasons were offered for the cocktail’s growing popularity among young women. 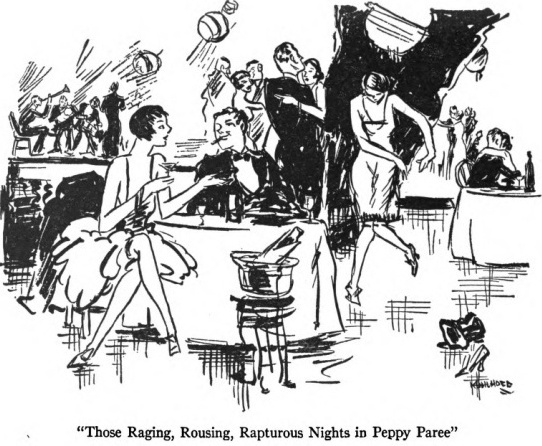 First off were the scandalous flappers: such women, it seems, would “naturally” take up male drinking habits in their general quest to “imitate the male” with “boyish” bobs, “masculine” cuts in clothes, and “readiness” to “take to cigarettes.” Other women came across it innocently enough via the need to “work like men” at co-ed jobs, where social drinking was part and parcel of the male work culture. Interestingly, Professor Achard of the Academy of Medicine saw it a vice unique to the working class: if they hadn’t been given so much “more time and money to waste in drink” thanks to those pesky new laws regarding eight-hour work days and wage increases, maybe they’d spend less time being drunk, he reasoned. He advocated for educating the working class in “the employment of their leisure time” so they could perhaps take up more” productive” and less “offensive” pastimes. Over time the older generation’s fears of cocktails began to spiral out of control. By the end of the 1920s many had begun to fear that the entire fate of the upper class was at stake. 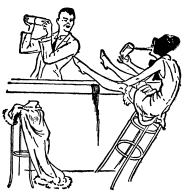 Some sought to ban the drinks outright, much as the government had banned the consumption of absinthe in 1915 for the sake of public health. Cocktails, doctors claimed, led to a special kind of hidden alcoholism that was a direct threat to future generations. Professor Emile Sergent, a member of the French Academy of Medicine and the French White Cross society, an anti-alcohol league, painted these “new” alcoholics as potentially insane, much like earlier absinthe drinkers: “the modern alcoholic…after absorbing a dozen cocktails in one day because it has become the style, appears comparatively unaffected, but in reality becomes physically and nervously undermined and eventually a psychopathic if not completely insane.” Allowing cocktail drinking to run rampant, Sergent warned, would not only lead to “the disintegration of the highest intellectual social classes,” but would decimate France’s population: “France in ten years time may be faced with an army of degenerates, inebriates and half-wit children, and all this in what should be the nation’s best social strata.” Professor Guillian of the University of Paris echoed Sergent’s conclusions and took them even further, claiming that American cocktails were responsible not only for “a variety of nervous and gastro-intestinal” issues but also caused “epileptic attacks, neurasthenia, and surexcitation.” The worst off, however, were the children of these new crazy alcoholics: such children would be “stunted, mentally debilitated, subnormal, and even idiots” if their parents indulged excessively in cocktails. Such cocktail-induced insanity among Paris’ elderly died down with the Great Depression and its subsequent impact on American tourism. Flashy, expensive hotels and posh bars found themselves deserted as tourists dried up. However, the changes American cocktails had wrought on Parisian culture—increased youthful drinking, not to mention a host of awesome new drinks—were there to stay. In the end, Paris and its cocktail infatuation was just another aspect of worldwide cultural and social changes brought about by the Roaring Twenties. Popular throughout WWI and Prohibition, this French cocktail was invented at Harry’s New York Bar in Paris. It borrows its unusual name from a famous piece of quick-firing field artilliary equipment, the French 75mm Field Gun. Considered to be the first piece of modern artilliary in the world, it rained either shrapnel-filled shells OR explosive shells down on enemy troops at an impressive (at the time, anyway) round of 15 rounds per minute; an experienced crew could get it up to 30 a minute. The French 75 gun was instrumental to the French’s success at the Battle of the Marne and at Verdun, mostly for mowing down charging troops—its shells weren’t strong enough to destroy trench fortifications, but it could sure blow some big holes in the enemy troops. The gun was so reliable that French troops used it throughout WWII as well. Note how the sugar and booze ratios change over time. 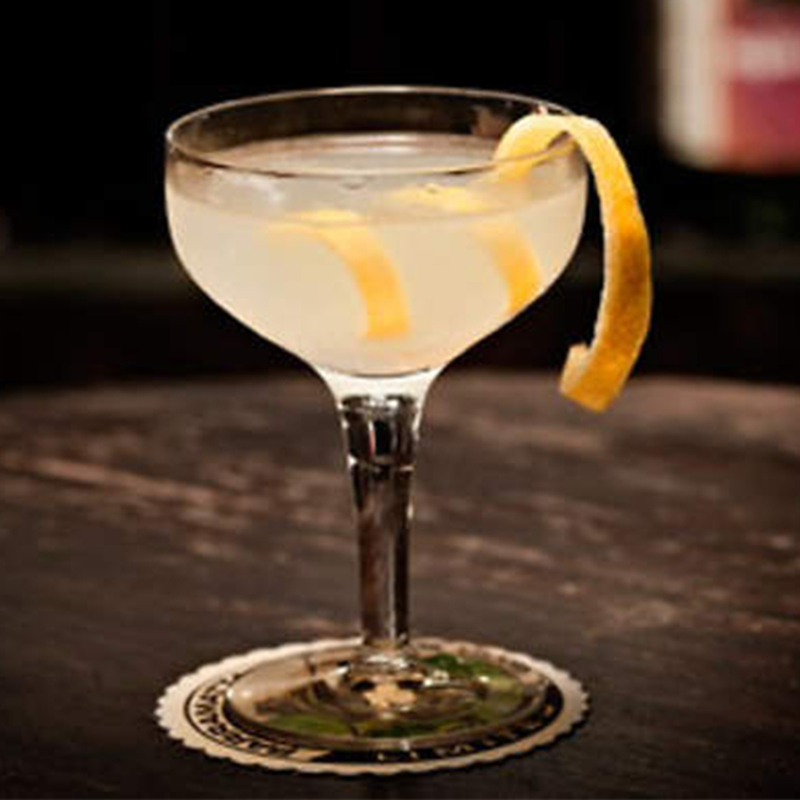 The modern day recipe below is another one from the Employees Only bar in New York. 2/6 gill of Dry Gin. Pour into tall glass containing cracked ice and fill up with champagne. Pour the gin, juice, and syrup into a mixing glass. Add large cold ice cubes and shake vigorously. Pour the champagne into a large wine goblet over large cold ice cubes and drop in the orange half-wheel. Strain the cocktail over it. Bruce Reynold’s Paris With the Lid Lifted is a strange and fascinating little slice of 1920s tourism. Written in a bizarre Dan Runyonesque style, it’s an engaging and funny look at traveling in France at the time. If you’re interested, the entire text can be found here, complete with period illustrations. Duecy, Erica. 2013. Storied sips: evocative cocktails for everyday escapes, with fifty recipes. This entry was posted in drink recipes and tagged 1920s cocktail recipes, drinking customs, drinking during Prohibition, French 75 cocktail recipe, French reaction to American cocktails, vintage cocktail recipes. Bookmark the permalink. Isn’t it strange how elders always worry about youngs for the same reasons?